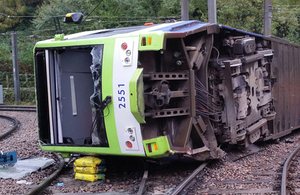 Mr Khan has written to the Rail Accidents Investigation Branch (RAIB), to draw his attention to a recent BBC TV programme, which claimed drivers were falling asleep at the wheel of Croydon trams but the trams did not stop. In the Victoria Derbyshire programme last week, it was claimed that four former drivers had admitted falling asleep while operating trams in Croydon and that the ‘dead man’s handle’ driver safety device had failed to stop their trams. It outlined concerns over specific faults with the driver safety device. The programme also reported that at least three trams have been recorded speeding since the fatal accident, with one incident taking place near to the Sandilands Junction, where a speeding tram derailed in November, killing seven people. Mr Khan said: ‘I am assured that TfL is working everyday alongside the RAIB to ensure all the necessary safety measures are implemented on the tram network. ‘Any allegations of safety breaches must be taken extremely seriously and I have ordered TfL to urgently investigate all the claims made in the Victoria Derbyshire programme. These claims are obviously alarming, and it is only right that they are considered by the RAIB. Mr Khan said he had received assurances that tram operator First Group has increased its speed monitoring and taken appropriate disciplinary action in any case where a driver was found to be going too fast and has an appropriate fatigue management system in place. He said he had also been assured that the driver safety devices meet industry standards and the specific fault mentioned in the programme was rectified.